Sandy Posey was a unique singer to come out of the mid 60s, when she combined the style of the girl group genre with the Nashville sound, and ended up with a string of sobering hits recorded between 1966 and 1968. RPM Records, out of the UK, bring together the best of these years on the fabulous 23 track cd A Single Girl: The Very Best of the MGM Years. 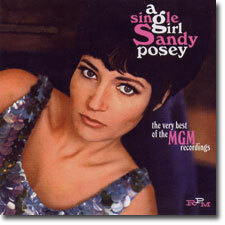 Rather than mine the daydreaming territory of so many other girl singers, or become a diva, Sandy Posey sang songs about the plight of the single girl and married woman in modern times, in a realistic, heart wrenching style. Backed by Nashville's best session cats, with songs written by the likes of Joe South, John D. Loudermilk, and Dan Penn-Spooner Oldham (as well as a certain young songwriter named Martha Sharp whom wrote Sandy's biggest hits), Sandy has some incredible material to work with here. There is much more depth in Sandy's song world than she has ever been given credit for. Thanks to her coming of age during the feminist informed 1960s, Sandy has been vastly misunderstood as an anti-feminist and dated singer. However, she sings of the truths of the world as it is for people like herself without a hint of bombast, and there's no doubt that Sandy is serious in her convictions. Sounding like Dolly Parton's cousin, Patsy Cline's little sister, or Elvis' thwarted lover, Sandy's songs represented a little known truth in a time known for its freewheeling, carefree atmosphere. There were still women grappling with their place in this world, a man's world of sorrow, regret and resignation, which hung over them like the biggest skyscraper in New York City and never went away. The world is not so one dimensional as people like to think it is, there are more options in this world besides loving or leaving, living or dying when the world takes on the dimensions of uncontrollable reality. In Born a Woman, Sandy sings "a woman's place in this old world is under some man's thumb," echoing the sentiments of The Rolling Stones unflinchingly, but adding the equally honest "if you're born a woman, you're born to be hurt." But what makes this sentiment so harrowing is that Sandy resigns herself to her fate, by admitting that even with all of the pain, she's glad she was born a woman. There's no place for the go go dancing, pill taking freewheeling girls in Sandy's world. The listener may have assumed that Sandy would break free of this oppression in the final lines of the song (as it would be in a typical feminist anthem of oppression), but Sandy gives the listener a gutpunch by saying she's "glad it happened that way." Born a Woman is about how one is born into their destiny by no choice of their own, but one can resign themselves and enjoy the fruits of a destiny which is out of their control like one enjoys animalistic urges brought to conclusion. The fact that Sandy is born into womanhood... not as a girl... not as a child even... means she's never even given the chance to grow, she must jump right into this world of uncontrolled destiny. This is her way of sacrificing her self, in order to give into the selfless control over her destiny. In Single Girl, Sandy centers her attention on the lonely, empty plight of the single girl. As she plods through life from one night stand to the next, she is fully aware of the torment that's to come, because she's aware of the heartless, lying men that have come before. Even with this cynical outlook, she can't lie: she "needs a nighttime love to get her through the day." Sandy does entertain the hope for a love of a man who will actually get to know her, but for now she looks forward to the next empty encounter. Born a Woman and Single Girl were a one-two punch to the women's libbers in the 1960s, surely making them cringe at the same time that they were realizing the truth in these words. No amount of feminist theory can discount the fact that we've never had a female president. Also, there is the idea that female produced art is reactionary by default and virtue of the "female/second class" citizenship of this world. This is still a debatable point and could let the breeze out of anybody's sails if she lets it. I Take It Back has some great guitar work by the Nashville crew, and is one of Sandy's best songs, as she realizes the damage she caused her man once she tells him she doesn't love him anymore. This is a brilliant song which starts out sounding like a girl group song with a Shangri-Las' style spoken introduction ("here he comes now" she tells us) where she proclaims to the listener how she will tell her man she doesn't love him anymore and they need to break up. However, when she tells him, he breaks down crying (at which point the song takes a dramatic turn away from the girl group sound to the "weepy" country sound), leading her to stay with him. She goes so far as to admit to him "I take it back, I'm sorry I must have been out of my head!" By the end of the song she tells the listener "sometimes it's better to be loved, than it is to love..." Not only is this song an anti-girl group song (rather than proclaiming her love for her man, Sandy is telling us how her love is dead) but also she doesn't even finish out what she states she is going to do at the outset of the song. This is like if Nancy Sinatra never ended up walking all over her man with those boots as she threatens to do (after all it was only a threat wasn't it?) in These Boots Are Made For Walkin'. We're left wondering if Sandy's man is worth the salt of his tears if she no longer loves him. Other great songs included on this RPM disc are Shattered, Arms Full of Sin, Hey Mister, I'm Your Puppet, Don't Touch Me, The Boy I Love, Sunglasses, Take Me With You Baby, Deep in Kentucky and One Man Woman. Shattered has a slow and mesmerizing rhythm which rolls along with a soulfully heart wrenching feel. It stands has one of Sandy's highpoints. Arms Full of Sin has an acoustic base and a string-laden arrangement which rises through the mix while Sandy sings about infidelity of love. Hey Mister has Sandy lost in the city looking for a way out, with one last hope to get back home. I'm Your Puppet has never sounded so convincing. Sandy sings about the end of love in Don't Touch Me. The Boy I Love was written by Sandy herself and has a wonderful early 60s sound to it (Sandy in fact wrote a number of songs included here). Sunglasses is Sandy at her most playful, as she runs through a list of everything she needs for a day at the beach, but one is left wondering just why Sandy needs those sunglasses (they are not just for the sun). Deep in Kentucky has Sandy running and hiding from her man into the deepest part of that state, in order to escape his sinister stalking ways. Take Me With You Baby is a sweet sounding song of yearning. One Man Woman is Sandy at her most storming and rocking as she sounds the most like Dolly Parton and I'm quite sure this song is a Northern Classic - a song that is often missed but shouldn't be. Sandy also does some wonderful covers - ones included on this RPM disc are The Fleetwood's Come Softly To Me - a standardly covered song in the late 1960s, and Sandy does it mighty well. Bobby Vinton's Satin Pillows gets a dreamy lounge feel in Sandy's hands, as Sandy sings about forsaking love and replacing it with riches. Sandy also does a wonderful dreamy version of Just Out Of Reach, a country favorite. Missing is her take on Shades Of Gray, a song The Monkees also recorded and which Sandy recorded on her last 60s album, 1968's Looking at You. This is too bad, but maybe this means a second Sandy collection is needed. Indeed, some other crucial Sandy songs are missing from this collection including I Can Show You How To Live, You Got to Have Love To Be Happy, Caution to the Wind, and Silly Girl, Silly Boy - all of which were collected previously on The Best of Sandy Posey disc; but also missing are such wonderful Sandy Posey MGM singles like Ways of The World (a Martha Sharp song which has Sandy singing "I'm weary of the ways of the world, yes I'm guilty of the ways of the world.... I go along hating myself but excusing myself.... but what am I to do? I need a little love, a little happiness..." This is a crucial Sandy Posey song which delves further into her song world and psyche because it contains the idea that no matter what she does she will be involved in sin and pain: a single girl goes from one night stand to one night stand; a woman, married, is cheated on and hurt). Also missing from this RPM disc are her Italian vocal performances of Born a Woman (Nata Donna) and Single Girl (Sempre Sola). Sandy Posey's world is a dreamy world of song, but not the dreams of a teenager who has never seen the world. Rather, Sandy's world is full of the aching dreams of the past, shattered dreams of resolute women who must soldier on in an uncontrollably dismal world of cruelty and heartache. In this mire, Sandy finds hope even under the most dire circumstances, because she has one thing that no one can take away from her. Sandy has a voice and is able to sing about her woeful dreams, and by singing of them, she is able to rise above them to become a better person. Thanks to the fine folks at RPM Records, the listening public is once again able to hear Sandy's voice loud and clear.